DULUTH, Ga.–(BUSINESS WIRE)–Nov. 8, 2017– NCR Corporation, in collaboration with Samsung Electronics America, Inc., today launched NCR Silver Quantum™, an all-in-one point-of-sale (POS) commerce station featuring an integrated payment device with mobile wallet acceptance capability, customer display, loyalty scanner and Samsung Galaxy tablet. The NCR Silver Quantum commerce station provides merchants a sleek, efficient system to better manage customer POS transactions and back-office operations. A 10.1-inch Android™ Samsung Galaxy Tab A tablet serves as the employee interface, featuring fast, touchscreen operation for easy management. 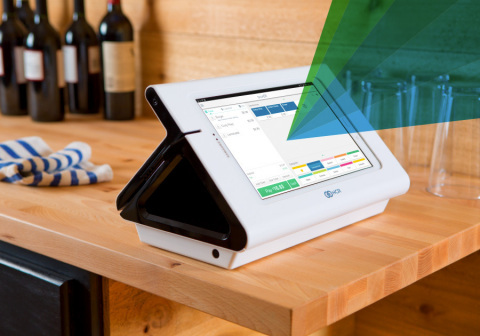 It is pre-loaded with the NCR Silver Android point-of-sale app, which delivers powerful functionality such as inventory management, marketing support and sales reporting once activated through NCR. Businesses can remotely set up and customize their NCR Silver Quantum device through Samsung Knox Configure, a cloud-based service and IT administration tool offered by Samsung. Chamblee, Ga.-based Ponko Chicken chose NCR Silver Quantum for its all-in-one functionality, intuitiveness and aesthetic. Co-owner Reiko Clark said the award-winning customer support also played a part in her selection. The popular family-owned restaurant, which has more locations in the works, offers a unique Japanese and Western spin on a fried chicken tender. Ponko Chicken just re-opened for business after initially closing its first restaurant in 2008, and Clark plans to expand further. NCR Silver Quantum and the NCR Silver family of solutions are designed for small- to medium-sized businesses such as retail shops and restaurants. To see the NCR Silver Quantum commerce station in action, watch this video. NCR Silver Quantum is the first full Android-based solution in the NCR Silver lineup. In addition to incorporating a Samsung tablet and Knox Configure, NCR Silver Quantum includes an embedded RP457c mobile card reader provided by Ingenico Group, which enables the commerce station to accept a variety of payment methods, including magstripe, EMV chip and NFC/contactless transactions such as Samsung Pay. NCR Silver Quantum offers market-leading battery life of up to 10 hours for merchants who want cordless operation, and has a small physical footprint, measuring less than 13 inches in width. Samsung’s enterprise division takes a vertical approach to business markets, and its retail practice delivers innovative in-store solutions that retail organizations can use to connect with customers, secure their operations, and enhance the opportunities presented by digital business. NCR Silver Quantum is part of a product lineup for every stage of business, including cloud-based point-of-sale software, e-commerce integration, hardware, NCR Silver ConciergeTM services, U.S.-based 24/7 live customer service, and powerful functionality such as NCR ConsoleTM that offers advanced employee management, inventory management and reporting. NCR Silver Quantum is now available with the NCR Silver Android POS app and will soon be available with NCR Silver Pro Restaurant Edition Android POS app. It’s offered in a bundle that includes hardware peripherals, services and a suite of cloud-based software subscription offerings. It can also be purchased separately. For pricing and detailed product information, visit www.ncrsilver.com/quantum or call 1-877-630-9711. NCR Corporation (NYSE: NCR) is a leader in omni-channel solutions, turning everyday interactions with businesses into exceptional experiences. With its software, hardware, and portfolio of services, NCR enables nearly 700 million transactions daily across the financial, retail, hospitality, travel, telecom and technology industries. NCR solutions run the everyday transactions that make your life easier. NCR is headquartered in Duluth, Ga., with about 30,000 employees and does business in 180 countries. NCR is a trademark of NCR Corporation in the United States and other countries. NCR encourages investors to visit its website which is updated regularly with financial and other important information about NCR. ©Samsung Electronics America, Inc. Samsung, Samsung Galaxy, Samsung Knox and Samsung Pay are all trademarks of Samsung Electronics Co., Ltd.
2019 © All Rights Reserved. DataTech a goPoint company.